Women's Wildflower Watch Just $37.49! Down From $75! PLUS FREE Shipping! You are here: Home / Great Deals / Amazon Deals / Women’s Wildflower Watch Just $37.49! Down From $75! PLUS FREE Shipping! Women’s Wildflower Watch Just $37.49! Down From $75! PLUS FREE Shipping! Looking for a gift? Amazon is offering this Invicta Women’s Wildflower Watch for just $37.49 down from $74.99 PLUS FREE shipping! 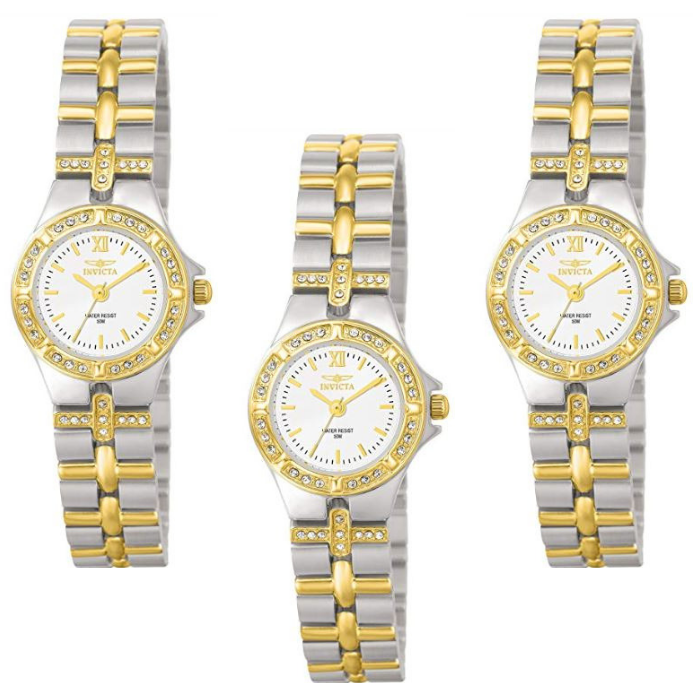 Discover the elegant design and radiant sparkle of the Invicta Women’s Wildflower Collection 18k Gold-Plated and Stainless Steel Watch. A round silver dial showcases gold-tone hands, a single gold Roman numeral at the twelve o’clock position, gold baton hour indices, and black minute indices. Holding a flame-fusion crystal to protect the dial, a stationary 18k gold-plated stainless steel bezel is encrusted with 24 shimmering white crystals. Adding even more shine, the matching two-toned 18k gold-plated stainless steel bracelet features 18 white crystal accents in a decorative cross pattern where the bracelet meets the case. This timepiece uses reliable Swiss quartz movement and is water resistant up to 165 feet (50 meters).